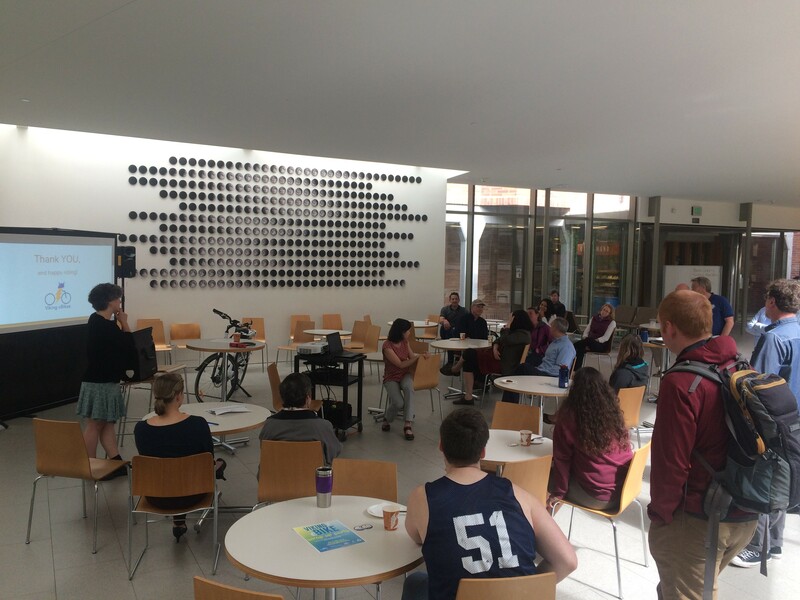 As the Viking eBike program comes to a close here at Western’s Sustainable Transportation office, we would like to recap the event we hosted on May 31 for those that could not attend. 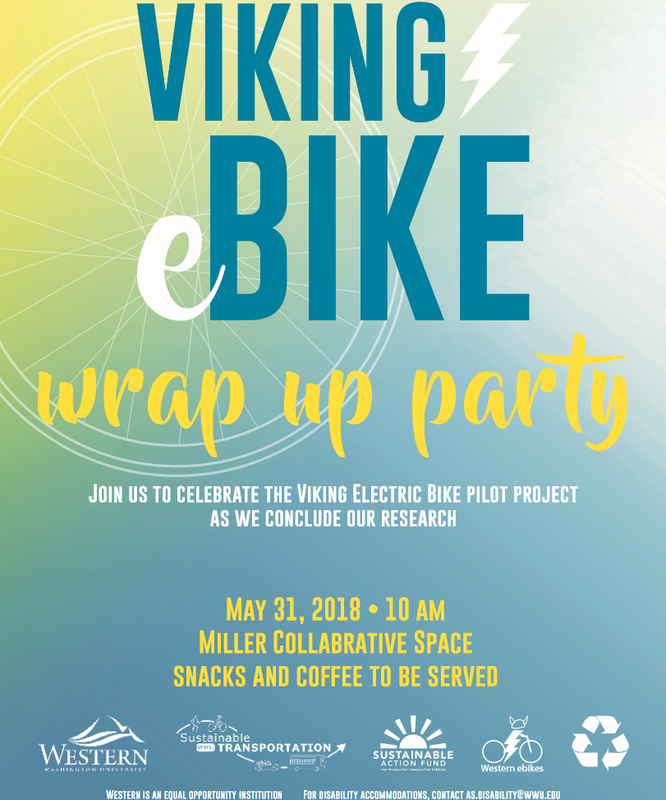 On the morning of the 31st, we hosted the Viking eBike Wrap Up Party to share with the University our findings from the past two years. 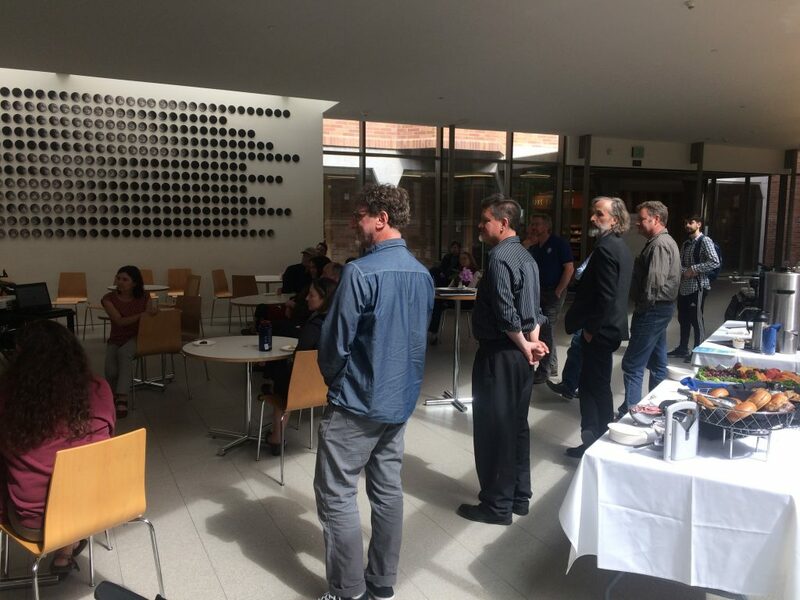 We were thrilled to have faculty, staff, and students join us for this event and to take part in the discussion that naturally flowed out of our presentation. To us, that was deeply rewarding and validating that we are not the only ones who care about integrating this sustainable technology into our lives. Other highlights from our event was in sharing our results. Much of our research gathering was qualitative, as is demonstrated in our eBike rider blog posts. We believe these stories go a long ways towards people understanding and adopting such modes of transportation into their lives. Of course, we also collected quantitative data, as well. The table below demonstrates many of the main data points we focused on. Personally, I am stunned that our riders collectively rode approximately 7,000 miles over the course of this program! We calculated that’s the distance between Bellingham, USA and Lima, Peru! Now that’s a ride. Our thanks goes out to all of the people who participated in our program from the students who jumped on their very first eBike, to the University’s departmental directors who have seen just how valuable the addition of eBikes are to their office. A special thanks goes out to Gary Malik at ATUS who spoke at the presentation with us about his personal and professional experience with Viking eBike. Thanks Gary! We have a few more blog posts in us yet. Check back in over the next couple weeks as we post the final rider stories from our last eBike riders of the Viking eBike program. Look who a Viking eBike found to hang out with! We love to see our eBikes mingle with other bikes and eBikes of the world. Makes us feel like proud bi-pedal parents. As our sun finally breaks free of our wet skies (for a couple days) we look forward to hearing how our new eBikers are adjusting to the electric bike experience. Dr Michael Medler of Huxley College is one of our new riders. He comes at the project with a long history of cycling, but due to more recent circumstances he has had to rethink his approach. Now that he’s got an eBike for 10 weeks things may be changing. Let’s see what he has to say…. “Thanks to everyone at the Sustainable Transportation Program for giving me the chance to try out an eBike for a while. This is my “first impressions” post after about a week of riding one the program’s Prodigy eBikes. First a little about myself… I am a 55 year old faculty member in Environmental Studies. I have been a lifelong biker and bike commuter. I live about 3 miles from campus a bit south of Fairhaven. Since coming to WWU in 2002, I have only even had a real parking pass for the 5 quarters my daughter was recently attending the WWU preschool. Otherwise, I have generally found other ways to get to campus. However, three years back I quite suddenly needed both hips replaced. Normally biking is one of the real success stories with these operations, but in my case, my left hip didn’t work out all that well. As a result, biking can still be rather “stressful” and hills are still prohibitive. While my daughter was attending the WWU Preschool over the last few years, many of her friends where being dropped off and picked up by parents with cargo eBikes. Many days, we would see small women heading off to climb South Hill with two children riding the on the back of a bike, with raingear and maybe even groceries in the paniers. This got me thinking that perhaps an eBike would be enough to get me back in the saddle. I have been considering an eBike for a while. My wife would use the word “obsessing.” I have been particularly interested in a cargo bike that could handle me and the kid. Therefore, I have been spending more than a small bit of time on the internet learning about the options out there. As I have learned more, I have had a lot of conversations with friends about eBikes. In conversations with some of my bike enthusiast friends, some of them have been rather snippy about me replacing my bike with an eBike. I have tried to make it very clear that I would be replacing the car, not the bike. So far this year, I have only ridden my own bike to campus a few times. Otherwise I tend to drive at least some of the way, and walk the rest as hip therapy. But for over a year, I have been really wondering if an eBike would make get me over hump and make real difference in my daily transportation decisions. The best thing about this eBike program is that it is letting me sort out a bunch of these issues without spending thousands of dollars first. For a little over a week now I have been riding the eBike pretty much daily. Therefore, I have already used it to commute more this academic year than I have used my own bike. I will report more later, but at this point I have a few initial observations after a week. First off, eBikes are a hoot! I wonder how long till it isn’t just hilarious to ride like this. My other eBike friends insist that the feeling doesn’t really go away. It is always fun to zip up a hill. However, eBikes are heavy. All the fun goes away if you have to lift it or move it around in rough terrain. However, I do know that some companies are coming out with much lighter bikes though. I think this will be a critical development for some people. It is still a bike! I was worried that the eBike ride would be so mechanical that it would eliminate the nice outdoorsy kinesthetic joys of biking. In fact I have found the opposite to be true so far. I was also worried that I was lying to myself about using it in bad weather. However, so far, riding in the rain is great. I can wear my best raingear and still get to work without needing to change cloths. I am clearly getting less exercise, but I am still biking to work, just without the sweat. I will report later if this keeps up as the novelty wears off. Thank you Michael for this wonderful write-up on your first impressions. We are excited to know that this program is helping reinvigorate you to get pedaling again. “I can’t believe it’s been 10 weeks! 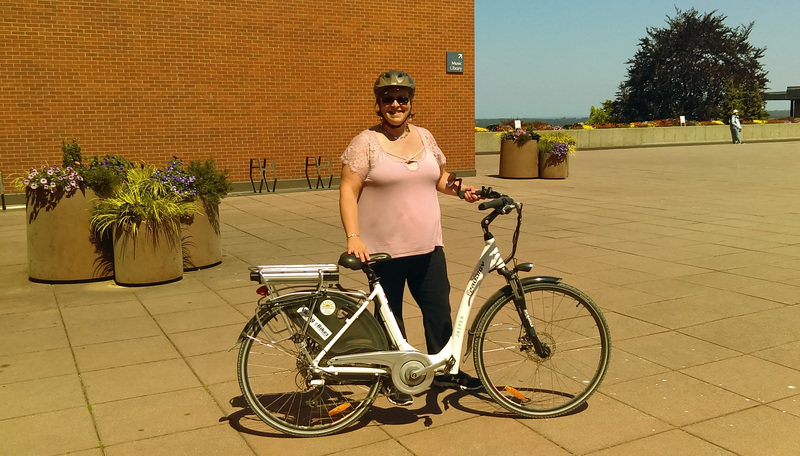 This is the 5th and last post in my serieson my experience with the Viking E-Bikes program, offered by my employer, Western Washington University, a program promoting electric bicycles as a sustainable transportation alternative. As I mentioned in my first post in the series, the program provides participants with a loaner e-bike, specifically the eProdigy Jasper pictured here, for the length of a 10-week academic term, asking only that the participants write a little about their experience, to be shared on the Rider Stories page of their website. Staci at Earl’s Bike Shop — the shop contracted to perform maintenance on the Viking E-Bikes — is awesome! When I needed to return the bike a second time, with suspicions that the calibration was off, Staci offered to pick the bike up at my home, which was a huge gift. As mentioned, with the bike being so heavy, I’m unable to put it on my car’s bike rack, and also unable to get it in the car, and so I would otherwise have had to ride the bike to the shop and then get a ride home. Staci then delivered to bike back to my home when the work was complete. Like I said: awesome! As for the calibration, it turns out that this was indeed the problem. Somehow, the bike’s computer had been switched from MPH (miles per hour) to KMH (kilometers per hour) and this threw everything off. I don’t fully understand the technology, but I suspect that if the bike is set to KMH the sensors on the brakes and gears need to be calibrated differently than if the bike is set to MPH. Sure enough, the first ride out once the bike was recalibrated to MPH was a dramatically better experience, from shifting gears and power assist levels, to using the throttle. The power assist is simply exactly what I need in order to continue to be a bicycle commuter, and I REALLY want to be a bicycle commuter, as I feel SO much better leaving the car at home and reducing my carbon footprint. As mentioned previously, the 5-mile each way commute, with hills in both directions, would be prohibitive without the power. As also mentioned previously, several other features of the bike were very much appreciated: the upright riding position, the suspension, the fenders, and the built in rear rack with provided pannier were all great. The battery, while unfortunately heavy, was more than adequate for my daily commute. I suspect that I could even get two whole days use out of it before recharging, but I opted to just bring the battery in every night and charge it. Jillian at Viking E-Bikes is awesome! She gracefully put up with my complaints about the bike and was very responsive, making arrangements for getting the bike to and from the shop in a very timely manner. The Viking E-Bikes program is a GREAT idea! It’s incredibly useful to have 10 weeks to ride and evaluate an electric bike, especially considering that it’s several thousand dollars to buy one. Normally you’ll get one or two test rides. Getting to take the bike home every night allowed me to experience the entire commute routine many times, in various weather conditions, and I even was able to fine tune my route in order to reduce time spent in traffic. The eProdigy Jasper is simply not the bike for me. While it is true that I enjoyed the upright riding position of this bike, which is partially the result of the bike’s geometry, I do suspect that the geometry plus the weight contributes to the overall clumsy experience riding, that feeling of a lack of nimbleness that evoked safety concerns as I mentioned. 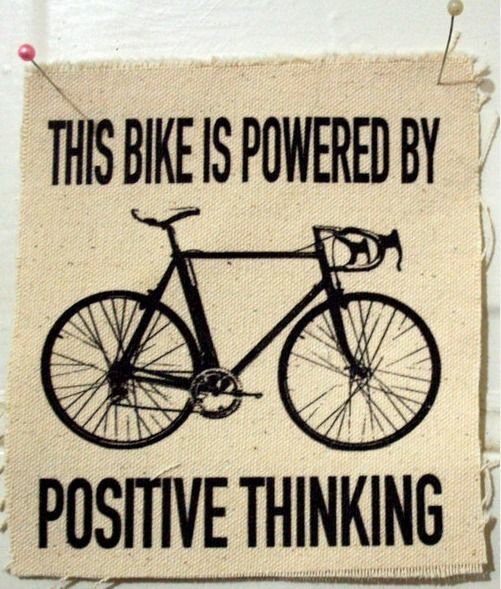 I’ll need to test this theory when I test ride other e-bikes. Love that the front headlight is powered by the bike’s battery, though the mount isn’t well-designed. The screw where the light pivots comes loose very easily due to vibrations of the bike. Also, it seems silly that a rear light is not provided and powered also by the bike’s battery: I REALLY don’t like burning through AAA batteries. Thanks for riding with us, Howard! As Winter quarter wraps up here at Western our weathered winter riders are beginning to roll in to our office. Lindsey Rieck, a environmental studies student with Huxley, was able to ride an eBike all quarter. One comment from Lindsey is that this bicycle helped her gain independence over her day and her ability to travel. We see this as one of the highest virtues of cycling and we hope that our eBikes give all riders a sense of independence. “As a student at Western Washington University living off campus, transportation to and from classes is a major aspect of my life that I have to think about everyday. Since getting to use Western’s eBike this past winter quarter, I have gotten to look forward to the fun experience of using my eBike everyday. In addition, there’s been the benefits of exercise, fresh air, transportation independence, and the knowledge that I’m using a sustainable form of transportation. Living a little over a mile from the school, it’s a bit far to walk everyday especially with a large hill. That can make walking or riding a traditional bike time consuming. Using the eBike this quarter, I’ve gained independence around inconsistent bus schedules, cars, and walking. Using the eBike, I’ve gotten the awesome experience of being able to pedal up a large hill to Western and still get to my classes on time. When going up this hill, I still have to pedal which gives me the opportunity to get some exercise, but still not getting exhausted before I get to campus. As an environmental studies student at Huxley, I received the opportunity to attend an orientation. This prompted me to write a short story about the eBikes for a practice article when writing for The Planet, Huxley’s environmental magazine. I found out just how great eBikes serve as an alternative to driving. Learning about all of the positive aspects of eBikes inspired me to apply to use an eBike for my own commuting. When first riding the bike it took a couple days to get used to the sleep and amount of power from the motor, but I’ve found it has become one of my favorite activities. Taking this bike around not only to transport me to classes on weekdays, but also around the town on weekends was a fun opportunity. Getting to ride around Fairhaven and to Boulevard park was one of the highlights. Whizzing around on this bike is not only beneficial for sustainability or health reasons, it’s also exhilarating. Traveling to new parts of town and exploring becomes a totally new experience on an eBike. Show and Tell: What Do 4510 Miles Mean? Our quarter long eBike riders have accumulated 4510 miles since the start of our program! Sounds like a lot, huh? But what does that mean? Well, let’s just say you could drive from Bellingham to Newfoundland, Canada and you’d barely reach 4510 miles. Kind of amazing, huh? We are quite proud of our eBike riders and we hope all those that see our riders buzzing about town feel so inspired to try it out themselves. Our transportation choices impact the world around us in all types of ways, but for the purpose of this post I will stick to carbon dioxide emissions. Exhibit One: If I was to drive a car from Bellingham to Newfoundland with an average 25 miles per gallon efficiency. Exhibit Two: If I was to ride an eBike from Bellingham to Newfoundland. Of course, neither situation fully accounts for other emission impacts along the way like the food and lodging you’ve consumed, as well. 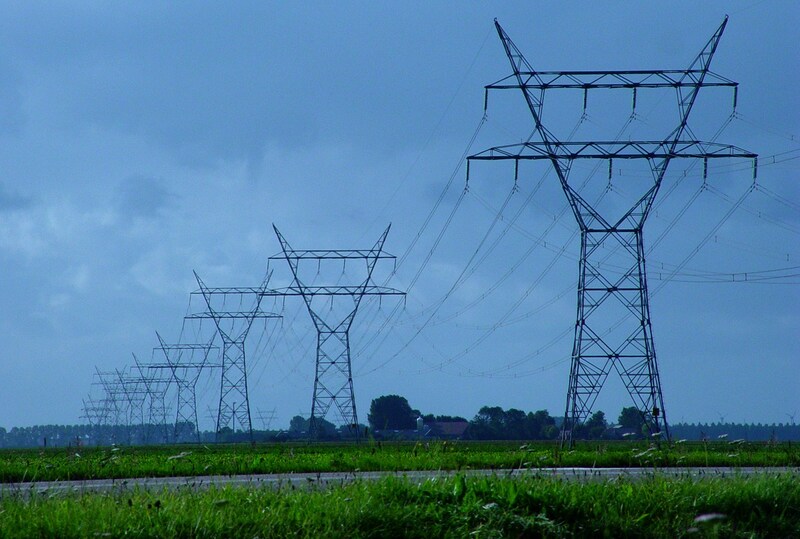 One would need to calculate a full Life Cycle Assessment (LCA) of such a trip to explain the full carbon accounting. It appears clear that to have the smallest impact on air pollution on a major trip, one must avoid traveling solo in a car or in an empty plane. Of course, one of these situations is much easier to control, but it does show the value in car/plane pooling. 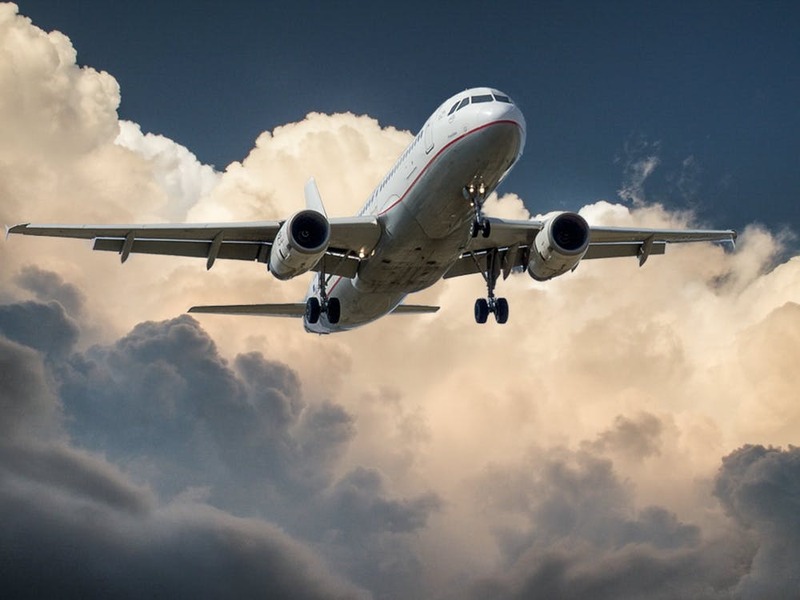 Air travel accounts for much Western Washington University’s current carbon footprint and is being addressed in the newly released Sustainable Action Plan. We recognize that bike touring is not feasible for everyone, but the more of us that take to our bikes and the roads, the more realistic it is for others to follow suit. Even short solo car trips add up on the carbon calculator, and that’s really what our quarter long eBike riders are addressing with their participation. 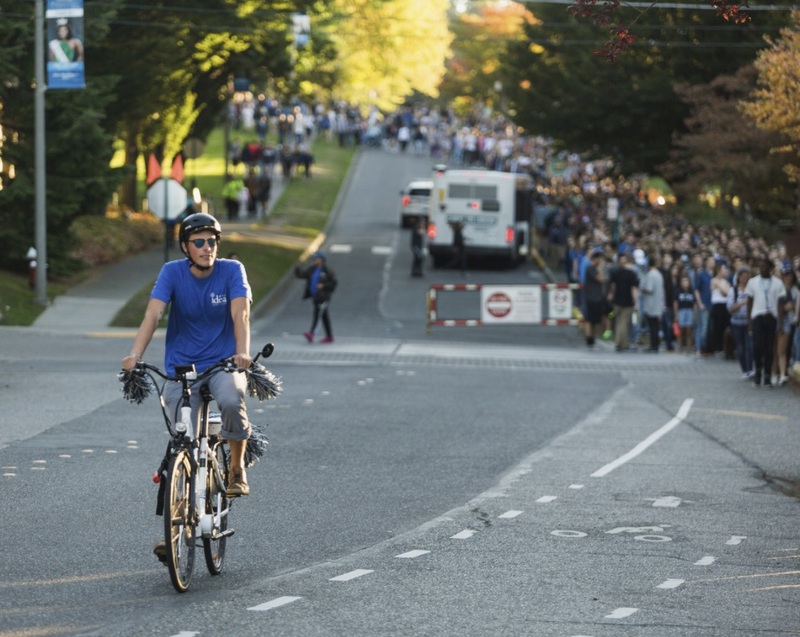 By creating new transportation norms for the university community, the Viking eBike program hopes to see how much easier it is to address the possibility of car-free travel. *These figures were calculated using the Carbon Footprint Calculator and the EPA’s calculator online. 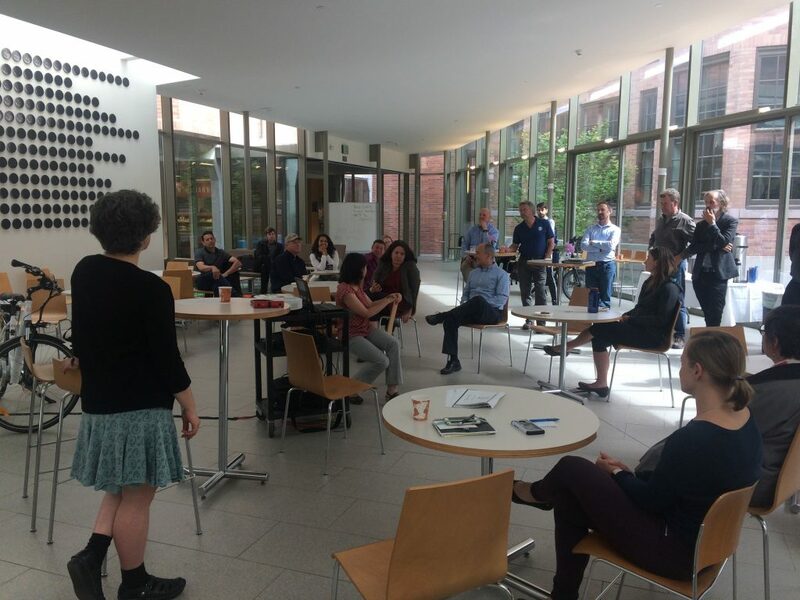 Last week, the staff of Western’s Office of Sustainability and the Viking eBike program traveled by train, bus, and carpool to Portland State University. 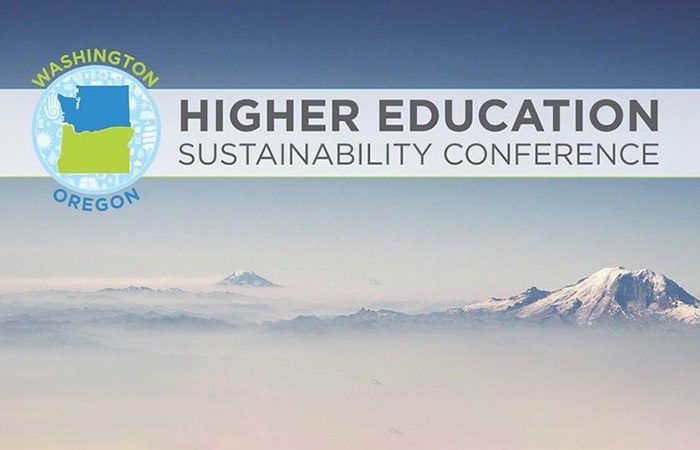 PSU hosted the Washington Oregon Higher Education Sustainability Conference which invited schools, companies, and inspired individuals to participate in an environment of collective learning focused upon what it means to be “sustainable”. Lead by keynote speakers such as Dr Brian Gibbs and Pandora Thomas the audiences at WOHESC were asked to consider our personal bias within our programming and mission framing. Audiences were encouraged to remind ourselves that, “We do not know what it is that we do not know,” as well as to truly dig into where we come from as a way to examine where we are today. Witnessing the conversations in the conference halls, workshops, and around the dinner table allowed us to realize that though we come from many corners of this region we are collectively working towards a common goal. However, as the theme of equity and inclusion addresses, we must learn to examine who has the power to assert change in our institutions. Our work at the Viking eBike program is especially aware of such accessibility issues. We recognize that eBikes are not equally available to all people despite our ability to make the program free of charge to all students, staff, and faculty. WOHESC was a great reminder to keep collaborating and keep pushing for a more inclusive and dynamic sustainability effort. It is well known that biking has many benefits, but what about with eBikes? And especially with the price tag how does it effect your wallet? Western economics researcher and associate professor, Sharon Shewmake, has the answer. After using one our eBikes, she put in the research to decide if it made financial sense for her to buy her own. “I’d been hesitant to purchase an electric bike. They are cost about $2-3,000, but you might be saving more by biking than you think. In addition to the financial savings, it’s hard to communicate just how much fun electric bikes are. They flatten the hills, and you feel like you are riding with a tailwind the entire time. But don’t trust me, go to Earl’s Bike Shop or Fairhaven Bike and test drive one. I had so much fun on my bike, and it was so much easier to run errands. There was one day when I had to take the bus home, I missed the Viking eBike loaner so much that I bought my own electric bike the next day! I know I will ride the bike because I have loved riding the Viking eBike. I’ve lost 5 lbs riding the eBike compared to when I was walking, biking and taking the bus without even trying to lose weight because I ride the bike so much more. It’s easy to attach a bike trailer to the eBike and take my kids around town. It actually takes about the same amount of time to get them into the trailer as it does to get them in and out of a car seat. My commute to my office is now faster than it was when I was driving and parking in the 12A lot. It will take me about 3 years to recoup my investment. * A parking permit at WWU costs $340/year. I live 2.5 miles from the closest parking spot to my office, I drive a relatively fuel efficient vehicle that gets 33 miles per gallon, if gas stays at $2.80 per gallon it costs me about $0.08 to drive one mile, however, the gas cost is an underestimate of the true cost of driving a car. 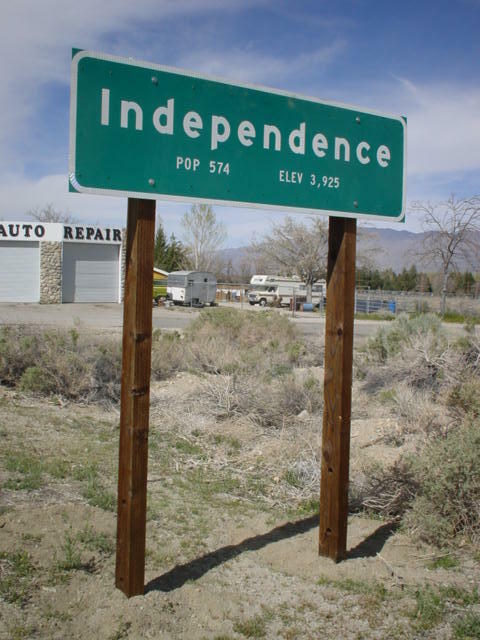 The cost of driving a car includes maintenance, insurance, towing, accidents and depreciation. The IRS calculates the cost of driving a car at $0.535 per mile. If I use this number, I save $670 per year. (5 miles per day * $0.535 per mile * 5 days per week * 50 weeks per year). Of course there is maintenance for the eBike and electricity for the eBike. That means I save $670/year (for not driving) + $340/year (for not parking), or a whopping $1,010 per year. If you live farther away, you save more. If you run errands after work with your car that you could run with a bike (it’s easier to park a bike downtown, at Trader Joe’s, etc.) then you save more. The cost of charging my eBike is about $0.00079 per mile if I pay PSE’s $0.06/kWh rates. This means I spend about $0.99 per year on electricity. I’m not yet familiar with the maintenance costs of an eBike. I used to get a tune-up once or twice a year for about $50 for a normal bike, if you include some flat tires, it might be about $100 for a bad year but most years it was much less. As long as the maintenance are below $109.01 per year on average, three years of an electric bike will cost me $3,030 which is how much I save on driving my car. This means that after three years, my $2,700 eBike will be saving me almost $1,000 per year! Add to that having more fun, freeing up the car for my family to use, getting exercise and being able to park closer to my office, never looking for parking downtown, and it’s a great deal! If you’d like to calculate how much an eBike will save you, I’ve created a spreadsheet that you can download and input your own information. “I purchased the eBike online from a little mom-n-pop shop in Wyoming. They had a beat-any-price deal than I could get straight from the manufacturer, or anywhere locally. It is scheduled to arrive on Wednesday, but it will arrive in a box and I will be taking it to Jack’s Bike Shop on Iowa Street to have it built. Where we always take our bikes for service. Thanks Stacey! Sounds like we’ll see you and about no matter the weather outside. 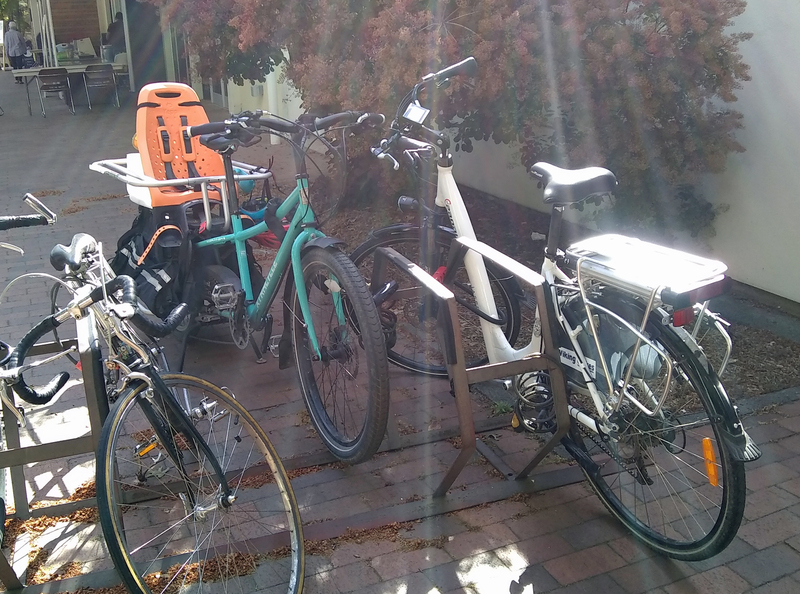 Here at the Office of Sustainability and the Viking eBike program, we share our office with many people. It’s a wonderful thing to be surrounded by hardworking visionaries who are acting on their commitment to make the world around them sustainable and healthy. I recommend it. Yet, here in my corner of the office I also share the space with a couple of fancy electric bikes. Usually, I only sit by them and admire their beauty, but last week when my personal bike needed to be taken to the shop I had the opportunity to use an eBike in its place. Of course, I get to show new people every week the greatness of our electric bikes, but when I experience it so viscerally for myself I gain a new appreciation. In the past 4 days, I logged 37 miles – mostly because when it’s an eBike it’s so easy to say, “Yep, I’ll ride my bike!” I love that. Finally, I would just like to share a quick anecdote from this mornings’ commute. When I roll up to a stop light on my eBike and there are cars behind me, I am always the first one off the starting line when the light turns green. An electric motor’s acceleration is far superior to any internal combustion engine as far as that goes, and it always gives me a deep satisfaction to show off what these eBikes can do – especially to those driving cars. Yes folks, the car that beat me and everyone else off the line was indeed an electric car – a Tesla. “Alright, I’ll give you that one,” I told their fading taillights. Come on by our office to check out the eBike for yourself and experience just what it’s like to (usually) leave those cars in the dust. Taking e-bike to a whole new level. Viking eBike on It’s Happening!